Two problems: In many Third World countries (as also in France), toilets and latrines are made for squatting over, rather than for sitting on. Basically they consist of a hole in the floor. This can be a big challenge for the wheelchair rider. Also, in some countries, people traditionally work and eat at floor level. In the Introduction of this book (page 15), we saw the difficulty that Mira had with her standard wheelchair. Its height kept her from joining in kitchen work and family meals, where everyone squats or sits on the floor. Finding Solutions: Solutions to each of these difficulties have been found by wheelchair riders and travelers. A simple solution to both problems has been devised by Ralf Hotchkiss. 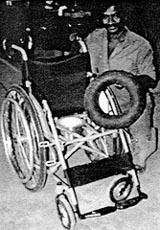 The device started as an improvisation to meet his personal needs, as well as those of other adventurers who travel in off-road situations and sometimes fall out of their wheelchairs. 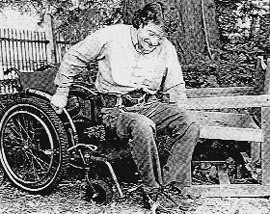 For Ralf and others whose spinal-cord injury is at a relatively high level, getting back into the wheelchair without help can be difficult. Wheelchair users, as part of their rehabilitation, are often taught to get back up from the floor using a stool or a box of an intermediate height. But on a country road or desert trail, a stool or box may not be available. JUMP SEAT. 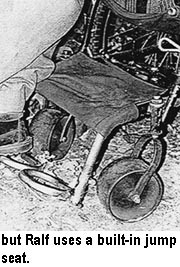 To get back into his wheelchair from the ground in such circumstances, Ralf designed a small cloth step, or "jump seat" (transfer seat), halfway between his wheelchair seat and the ground. TOILET SEAT. While traveling in Kenya, Ralf faced the difficulty of trying to use pit latrines that had no seat. A Kenyan wheelchair rider suggested that he cut a round hole in the jump seat of his chair, and perch on that. Ralf did so, and it worked. Note: Where Velcro is not available or is too costly, the flap can be held with buttons or ties. Consider again the example of Mira, mentioned above and in the Introduction. 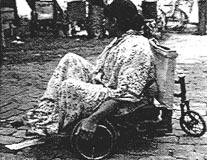 In order to work in the kitchen and eat with the family at ground level, she obtained a low-riding wheelchair, or trolley. 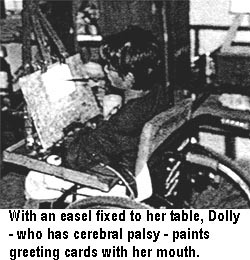 But a jump seat on her standard wheelchair also might have helped her to easily move to the floor for meals and other activities. Trolley. 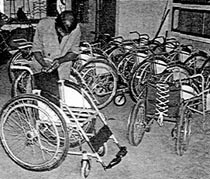 At the Center for Rehabilitation of the Paralyzed (CRP) in Dhaka, Bangladesh, low-riding trolleys are often used instead of wheelchairs because people traditionally eat and cook at ground level (see page 15). 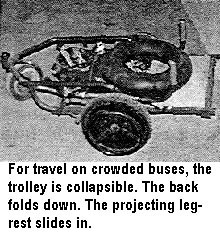 The trolley rider sits on a soft coconut-fiber mat on top of an air-filled inner-tube (from a motor-scooter). To convert the tube to a toilet seat, the person just removes the mat. Wheelchair. 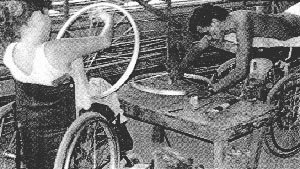 The center in Dhaka (CRP) makes wheelchairs with a frame similar to Ralf Hotchkiss' Whirlwind. 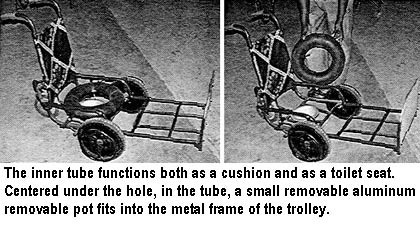 As with the trolley, however, a motor-scooter inner-tube is used as an air cushion, and also serves as a toilet. 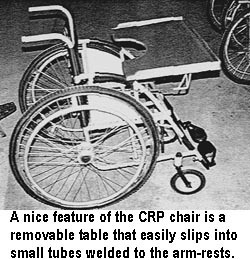 Notice that the CRP wheelchairs have several of the same innovative features as does the new Whirlwind design. These include the laced back-rest which allows adjustment of the chair width. The goal of a wheelchair is to increase the person's possibilities. Some of the best innovations come about through bridging conventional barriers and sharing widely varied experiences and skills. Remarkable designs have been developed when - by working together as equals - the gap has been closed between the First and Third Worlds, between professional and lay-persons, between the provider and recipient. Wonderful things happen when persons from different backgrounds pool their abilities and their dreams and learn from each other. 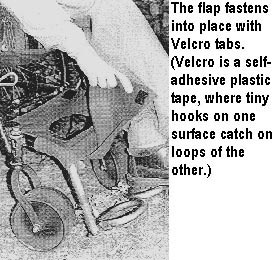 According to Ralf Hotchkiss, this has been the secret to the evolution, and the many breakthroughs of the Whirlwind wheelchair. 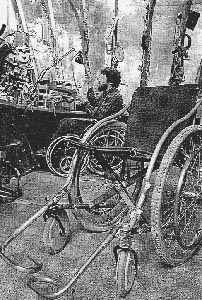 In the workshop in his California home, which has been imaginatively adapted for doing work from a wheelchair, Ralf experiments on and improves new designs and inventions by disabled wheelchair builders from many parts of the world. Jaime, one of Ralf's students and co-workers at PROJIMO, joins his girlfriend, Irma, in spoking the wheels of an improved model of the Whirlwind wheelchair. By sharing ideas and working together, Ralf and PROJIMO team make design improvements that neither may have realized alone. 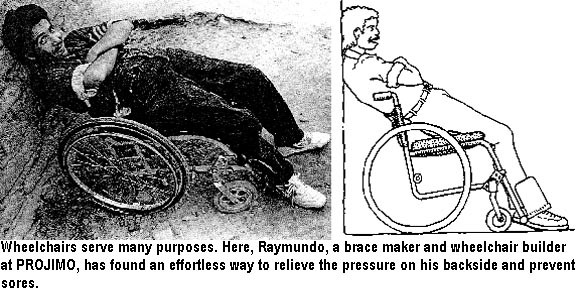 For many wheelchair riders, the biggest danger of all is pressure sores (see Chapter 27). Good cushions help. But the design of the chair can also make a difference. If the rider has a spinal-cord injury fairly low down his back, he may prefer a low back-rest like this (Picture below). Every few minutes he can lean far back to lift his backside off the seat, thus helping to prevent sores. (But if his injury is higher-up, he may want a higher back-rest for more support.) Each individual's needs differ and may change over time.